Six vulnerable adults have been working towards an NVQ Level 1 in agriculture after volunteering at Susan’s Farm in Houghton in Carlisle. Susan’s Farm was awarded £1,861 in grants from the Cumbria Industries Amenities Fund and the Carr’s Group Fund to support and encourage the six men to complete the course at Newton Rigg College. 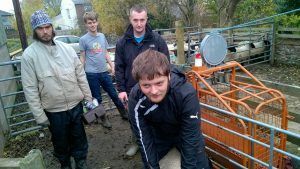 The farm has been helping vulnerable people for several years, offering hands on experience working on a real farm and skills training to gain land-based qualifications. The six men, four who have long-term mental health issues, and two who have special needs, have all volunteered on the farm for over a year. For some of the volunteers, coming to the farm guarantees them a routine, exercise, company and decent meal once a week. Working towards the qualification stretches them intellectually and lets them practice more challenging tasks on the farm, building their confidence and their skills. The sister of one of the men is delighted in the change in her brother since volunteering at the farm: “My brother is 46 years old and has learning disabilities because of multiple convulsions when he was younger. He was heavily medicated to prevent fits and was withdrawn from mainstream school. He has very limited reading and writing abilities. “As a young adult, it was difficult for him to gain any employment so he seemed consigned to a life of claiming benefits, without any meaningful direction in life. He has suffered from depression and sought solace in alcohol. “Despite some initial problems, I can honestly say this opportunity has turned my brother’s life around completely. He has found his niche! My brother takes more responsibility for his actions, his overall appearance is smarter, and his small flat is much tidier.